Do you love birds and need that last final touch to finish your homes' bird decor, then look no further than this lovely Black Bird Basket MatMates . This beautiful kitchen mat features a recycled rubber back which will keep it from sliding around on your hardwood floors. In addition, the polyester top surface is soft and stain resistant due to the dye injection process used to createe the beautiful top surface picture. This doormat insert functions well on its own or it can be used as an insert in one of our innovative doormat trays. The trays are specifically designed to combine excellent function along with beautiful form. The indoor cushion comfort tray gives your mat a beautiful border while adding a soft surface great for relieving stress in your joints when standing in one place for extended periods of time. See all the details here. 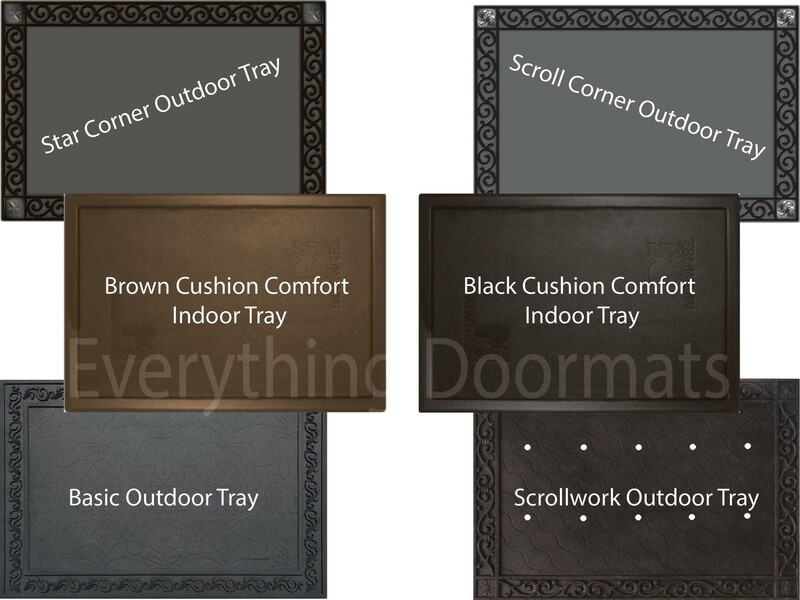 Our outdoor tray makes you Black Bird Doormat stand out with its beautiful design and rust resistant zinc corners it is an excellent accent for your beautiful MatMates . All weather construction making it ideal for use indoosr or outdoors depending on your decorating needs. A 100% recycled rubber back that is slip resistant in addition to making for a great Green addition to your home. A fad and stain resistant Polyester top surface. A dye sublimated printed image for a beautifully rendered image. When used by itself as a stand-alone kitchen mat this mat is 18" x 30". Care instructions can be found here and offer a good selection of tips and tricks for caring for your new doormat. Note: The Animal Black Bird Basket Welcome Doormat is pictured in our Brown Cushion Comfort Tray. The outdoor trays and Cushion Comfort Trays are sold separately.